Ok, so I think we have had our fun for the week now. Also, just so we are clear, I was not on this helicopter. Around 10:10am this morning, just up the road about half a mile there was a helicopter crash. Now when I say up the road, I do not mean in general, I mean up the road that my office is on. The crash happened around the intersection of Aztec & Vassar NE. From what I understand the helicopter lost power up in the sky, and on its way down, it struck one of PNM's large feeder power lines wiping out power to lots of people in the area (expect for us). 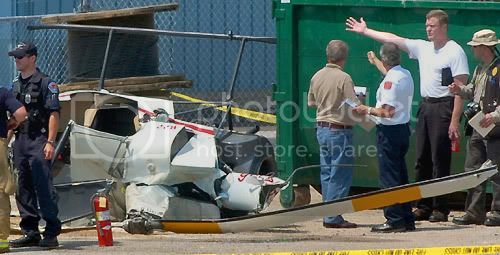 Remarkably the pilot is just fine and walked away from the crash. Also I swear that the media must have wet them self as this is the biggest breaking news story we have had here in the Albuquerque metro area in a long time. All 3 news stations (ABC, NBC, & CBS) had there own helicopters up in the air circling the area for at least 3 hours after the crash. I must say that I find it kinda ironic that the news stations were using helicopters to cover the crash of another helicopter. I do not know why I find this amusing or ironic, but I do. Also I can not tell you how many calls we took from family, friends, and associates wanting to make sure that we were ok.